The delegation from Seoul is pushing for talks between the nuclear-armed regime and the U.S.
North Korean leader Kim Jong Un discussed a possible summit with envoys from the South's President Moon Jae-in, both sides said Tuesday, in the latest step of an Olympics-driven rapprochement on the divided peninsula. The delegation from Seoul is the most senior to travel North for more than a decade, and comes as Moon tries to broker talks between nuclear-armed Pyongyang and Washington, after months of high tensions. "Hearing the intention of President Moon Jae In for a summit from the special envoy of the south side, he exchanged views and made a satisfactory agreement," KCNA said of the North's leader. However, Seoul said no agreement had yet been reached on a meeting between Kim and Moon, which would be the first such summit since 2007. The two sides have "discussed" it and "somewhat shared the view" on other points, an official from the South's presidential Blue House said. KCNA said Kim "warmly welcomed" the South Korean officials, who handed over a letter from Moon. Kim's discussions with the South Koreans lasted more than four hours, and included dinner at the North's ruling Workers Party headquarters in Pyongyang, according to the Blue House. 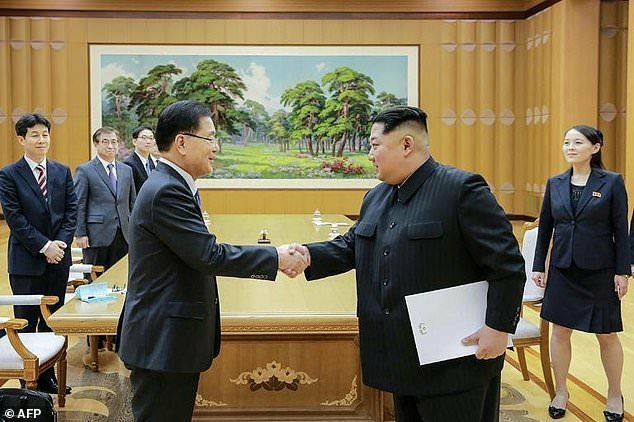 The delegation from Seoul is pushing for talks between the nuclear-armed regime and the United States, after the North Korean leader sent his sister Kim Yo Jong to the Winter Games in the South and invited Moon to a summit in Pyongyang. Kim Yo Jong's trip was the first visit to the South by a member of the North's ruling dynasty since the end of the 1950-53 Korean War, and her appearance at the Games' opening ceremony -- where athletes from the two Koreas marched together -- made global headlines. The Winter Olympics provided "a good atmosphere of reconciliation, unity and dialogue between the north and the south," KCNA quoted Kim Jong Un as telling the South Korean envoys. It is a challenging task -- in defiance of U.N. sanctions, the isolated and impoverished North last year staged its most powerful nuclear test and test-fired several missiles, some of them capable of reaching the U.S. mainland. U.S. President Donald Trump dubbed Kim "Little Rocket Man" and boasted about the size of his own nuclear button, while the North Korean leader called Trump a "mentally deranged U.S. dotard".